Screen printed, best quality outdoor decals with protective polyurethane topcoat. We use double glue decal material that works great on to rough surfaces. Label fuel containers and work trucks to prevent fuel mix up's. Type the quantity in the box. when you get to the Paypal Payments portion of check out and the credit card option will open up. Prevent improper mixing and possible engine damage. 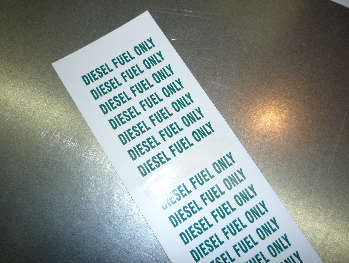 Label fuel containers and work trucks with the large 9"x2.25" decal. 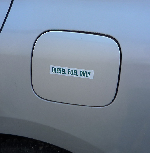 Label equipment, machines and fuel tank doors with the small 3" x 1/2" decal. IF YOU ORDER 1 YOU GET A TOTAL OF 5 DECALS, 2 = 10 DECALS AND SO ON. REFLECTIVE FUEL DRUM DECALS 20" X 5"
Best quality outdoor decals screen printed on 3M 3200 Reflective material. These reflective decals have been coated with a polyurethane topcoat. Label fuel drums or tanker trucks. ALUMINUM SIGN 12" X 6"
Best quality outdoor sign screen printed on .032" ALUMINUM. Our screen printed aluminum signs are printed using a solvent based ink that is cured at 400 degrees. The aluminum signs have been coated with a polyurethane topcoat. Filling up with the wrong kind of fuel can be a disaster. These little decals could go a long way to prevent that possible occurrence. These decals are cheap enough to be considered a disposable item, less than 9 cents per decal. Apply to car fuel doors without worry, the removable adhesive will come off clean. If you need the decals to last a long period of time the glue is rated for up to two years outdoors. Our removable stickers are printed on FLEXmark PWVR (Promotional White Vinyl Removable). FLEXmark PWVR is a 3.25 Mil flexible white vinyl that provides durability and easy installation. The pressure-sensitive acrylic adhesive bonds well to a variety of surfaces including chrome-coated surfaces and painted plastic. The most important feature of this material is that it is easily removable for up to six months after application. The six month removable makes your stickers hassle free and totally temporary should you wish, but adhesive is also rated for two years out doors, should your cause need more time. We Screen Print our removable Stickers with the best quality solvent based inks, for the longest lasting outdoor print available. The printing on these stickers will not fade or scratch off. Because we make all our products completely in-house, WE KNOW HOW THEY ARE MADE. WE CAN GUARANTEE OUR PRODUCTS ARE PRINTED WITH SOLVENT SCREEN PRINTING. We screen print the finest quality products with solvent inks for the longest possible outdoor life. This is not cheap digital printing, Flexography or UV printing that fades and peels outdoors.